on it. Get ready to be dazzled). of cookie, I do have something else to show you. and draws figures that will make you swoon. included) for that matter, is one I understand. earned a living painting, writing and teaching. if I teach, how can I be an artist really? How? artist, or you can flip it depending on the day. play, but hobby is a light word for a deep process. today knowing I'm working very hard right now. 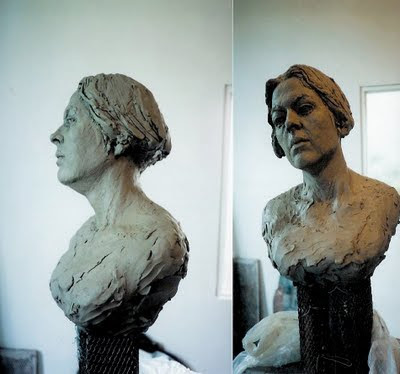 So my image today is of her wonderful sculpture. are that she's come out into the blog world. Labels: Check out Marcia Labelle and her wonderful work. sculpture. Thank you for sharing cohen's work. I couldn't resist signing up to follow her. One rarely sees sculptural work of that quality in blogland. Excellent post, Barbara. What kind of hobby does a painter have anyway? Maybe, genealogy research, math, medical issues or cooking? It certainly is something that is fun, but not a calling on one's life. For me it's playing the electric guitar...poorly, but with enthusiasm. So, I hear you and hope to continue toward renaissance. Thank you for sharing your thoughts on this and for the link to Marcia's fabulous work! No I saw you in a play once and you were magnificent, with a gorgeous, compelling voice. get ready to be dazzled. Marcia is the kind of artist who excels at whatever she does. And she's modest, but we're working on that. I guess my hobby then is singing off key and annoying my "audience." Thank you for introducing us to the wonderful work of your friend! She IS really good! I will definitely visit her blog in the future!